This article was posted on 15th March 2016. 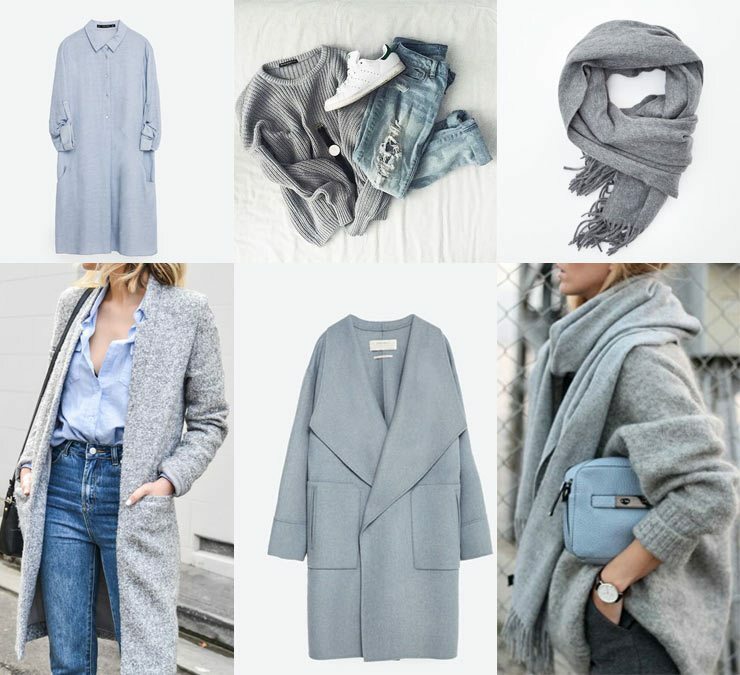 Always a beautiful and sophisticated alternative to it's more feminine antithesis of blush pink, pastel blue coupled with a soft grey is always a winning combination for our interiors and Spring wardrobes. Not sure you can pull off blues and greys? Think again! Layer luxe fabrics like fine knit cashmere and wool with relaxed tailored lines, perfect for this time of year when the sun might be shining but there's still a bite in the air. This colour pairing really is perfect "Sunday morning chic" outfit material - throw that blanket scarf over a chunky knit with a light wool coat, boyfriend jeans and Stan Smiths - et voila! We can just imagine making a quick dash to the Parisian patisserie on a fresh Spring morning - we can but dream! Here's some of our top picks to get you into the blue. Shop the look, clockwise from top left: Tunic from Zara; Acne Melange Scarf; Handmade Wool Coat from Zara. The addition of baby blue to your home can bring a sense of light and space - like a breath of fresh, sea air. 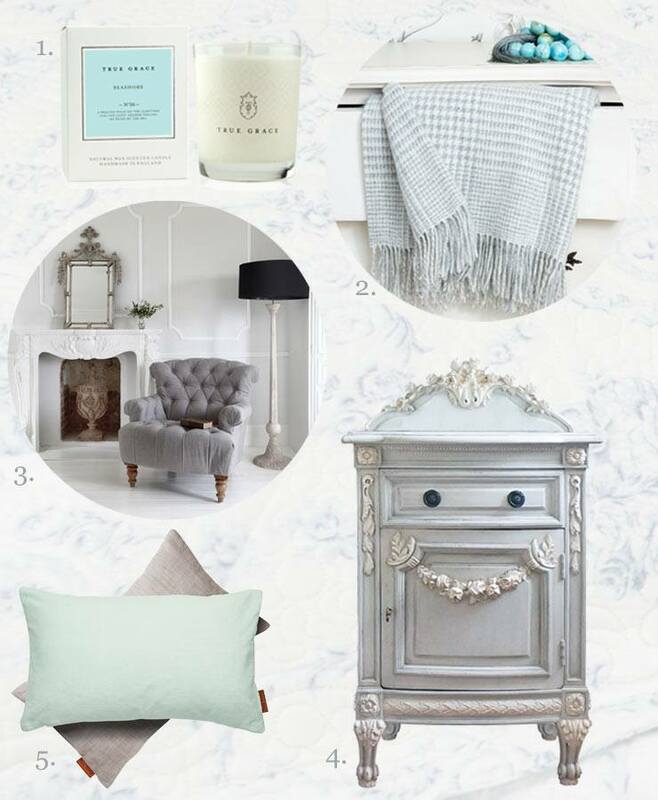 Like all pastel shades the versatility of light blue allows it to bring a French Country twist to a shabby chic home, a pop of colour to soften a modern white washed home or a subtle background to make your furniture and accessories truly shine. In the same way laying back to stare at the blue sky or gazing out across the sea on a bright day feels good for the soul, in colour psychology blue represents peace and tranquility whilst promoting physical and mental relaxation. Blue tones reduce stress and create a sense of calmness and order. These qualities make it the ideal colour, although not an obvious choice, for the bedroom - whether as a colour for the walls or as an accent colour on your furniture and soft furnishings. In a similar vein, grey is a cool, solid and stable colour, known for creating a sense of calm and composure whilst offering relief from a chaotic world. The two colours combined make for a harmonious fusion of calm serenity - a much needed respite in our hectic and busy lives - just what we need when we come home after a non-stop day. Bonaparte French Painted Dressing Table, Strictly Studded Tall Mirror, Antique Venetian Glass Bedside Table, Polygon Pendent Lights, Bergerac Grey Silk Upholstered French Bed. 1. True Grace Seashore Scented Candle 2. Prince of Wales Grey Check Blanket 3. Buttoned Charcoal Deep Linen Armchair 4. Bonaparte French Bedside Table 5. Aqua Velvet Cushion. Background: Florence Blue Toile Bedspread.